This is the last week of school for my daughter Bridget. So naturally I made a thank you card for her to give to her teacher. Bridget had a fantastic year in Grade One, and what better way to say thanks to her teacher than with a card covered in bookworms. It really is quite fitting as Bridget has fallen completely in love with reading over the course of this year. She reads constantly and we are incredibly proud of her. 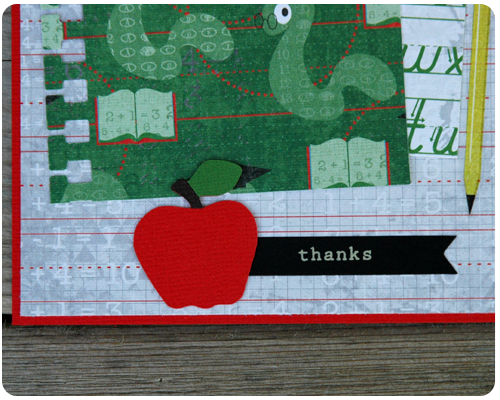 Did you notice the punched border on the bookworm paper? Don't you just love that it makes the paper look as if it was torn from a notebook? I bought this punch specifically for school themed projects and was so excited to use it on this card. I am going to let Bridget write her own note to her teacher and I can not wait to read what she has to say. I also have a gift for her teacher that I finished making this weekend...I'll show you that later in the week. Oh, I can not wait for school to be out, and for the carefree, fun days of summer to begin. What a cute card!!! I will have to make for next year!! Thank you so much for stopping by and for following along. What a great homemade card for your daughter to give to her teacher! Thank you Lanaya. Bridget was so excited to give her teacher something that I had made...which made me so incredibly happy.